I took a run at the Rhone Rangers’ Tasting a couple weekends ago (Sunday, April 6). It has moved from Fort Mason in San Francisco to Craneway Pavillon in Richmond. What a spectacular venue. Wall of windows looking across the Bay right at the Golden Gate Bridge. I was there in the afternoon, but sunset must be spellbinding. As is my habit, I picked one variety on which to concentrate my attention. Mourvèdre has been around for a long time. It is thought to have been brought to Spain by the Phoenicians two centuries before the Muslims arrived on the Iberian Peninsula, and nearly a century before the Islamic Prophet Mohammad was even born (570 AD). The Spanish name for the grape is Monastrell. The grape moved east, and acquired its French name in the late 17th century, which is about the same time Cabernet Sauvignon was spontaneously hybridized in Bordeaux. While not prominent, the grape also moved to California and Australia (where, for a long time in both places, it was called Mataró). It showed up in Australia in 1823 (in Dr. Busby’s importation), and played a role in the Barossa Valley’s production of Port-substitutes for the London market. In California it was part of the collection brought to Santa Clara by the Pelliers in the 1860’s. It was a popular addition (along with Carignan, Zinfandel, Petite Sirah, and Alicante Bouschet) to the field blend vineyards Italian immigrants liked so much in California. Since the advent of the Rhone Rangers in the mid-1980’s, Mourvèdre has played a more publicly recognized role in the GSM blends of both California and Australia. Bonny Doon’s Cigare Volant was probably the first example to gain notoriety in the US (1983 initial vintage), and Randle Grahm played a pivotal part in explaining that California’s old Mataro vines were the same grape as Mourvèdre in the southern Rhône Valley. Chateauneuf-du-Pape was, of course, the classic example of this blending genre, and the Perrin family’s Ch. Beaucastel was a particularly well-known example in the US. Beaucastel is usually about a third Mourvèdre. That’s a little unusual; Grenache commonly dominates, followed by Syrah. When the Perrins came to Paso Robles to join their US importer, Robert Haas, in a winery called Tablas Creek, it was only natural they would rigorously evaluate Mourvèdre in California on its own. Moreover, they brought their modern French clones with them. Mourvèdre as a stand-alone varietal flourishes in the Bandol region of the French Riviera east of Marsailles, but west of Monaco, Cannes, and St. Tropez. As such, it gets a lot of exposure in Europe, both as a hearty red, and as a rosé (made by bleeding off part of the juice just as fermentation starts in order to concentrate the color and tannin in the remaining red wine). At one point Bandol wines represented a great bargain. However Kermit Lynch, an importer from Berkeley, put paid to that situation back in the 1980’s. He imported Bandol’s best wine to the US, Ch. Tempier, and quickly drove the price from $16 to $35. Alice Waters and Chez Panisse were complicit in this aggrandizement of Ch. Tempier. It goes nicely with grilled vegetables. 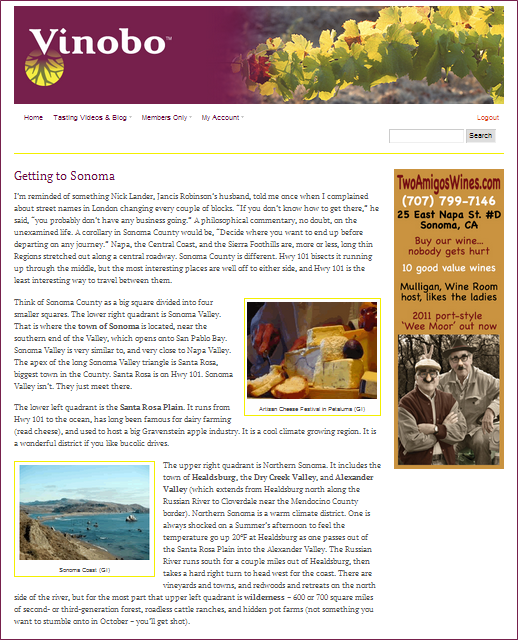 Over the last eight years or so Paso Robles and places like El Dorado County in the Sierra Foothills have been waging a relentless campaign to popularize Rhônish wines. I don’t see it as a zero sum game, whereby a bottle purchased from one area means one less bottle purchased from the other area. I see it more as an attempt to release the tide, which will in turn raise all boats. Furthermore these two regions present different growing conditions, which should eventually show us certain terroir characteristics. That’s an insight to which we can look forward, and I was hoping to tease it out of this Rhone Rangers Tasting. El Dorado is colder, with more rain, and a shorter growing season. Soils in Paso Robles have a higher pH, and more carbonates in them. Could I taste these attributes? First let’s take a cut at the fruity aromas displayed by 100% varietal Mourvèdres. I’m really tempted to say El Dorado produces something akin to cranberries, whereas Paso Robles produces more of a really ripe black cherry note. Would that wine criticism were that straight-forward and organized. It wasn’t a one-to-one correspondence. Let’s call the distinction a tendency. What seemed more apparent though, was a distinction between fruity examples, and what the pourers liked to call “earthiness.” One winery even had an example of each. Oz Clarke, the British song-n-dance man turned wine personality, comments that a ‘barnyard’ character serves as signature for Mourvèdre. It is certainly true Ch. Beaucastel was famous for that smell over a great many years. I’m sorry, that’s brettanomyces, a microbiological infection. It comes from winemaking practices; not from a grape varietal. We can argue coherently about whether it adds complexity when present in small amounts, but full-blown examples smell like a day at the racetrack, and that’s a fault. I find the phrase earthiness completely disingenuous. It implies minerality. Brett has nothing to do with minerality; it has more in common with stinky cheeses. One common byproduct of a Brett infection is 4-ethyl-phenol, which you would recognize as the solvent that makes bandages sticky. ‘Adhesive’ and ‘mineral’ may seem like somewhat similar characteristics in wine, but it is wrong to conflate them together. A truly distinguishing feature between Mourvèdres is heft: alcohol, body, tannins, pigments, overall mouth-feel. These are all positive contributions Mourvèdre makes to a blend, but they can easily become too extreme in a stand-alone model. They can also seem coarse. Paso appears able to produce these ingredients routinely; El Dorado much more rarely. So one may fairly posit the best Mourvèdre vintages in El Dorado will be warm ones, but wait. Mourvèdre has a thick skin, and relatively small bunches. It shrugs off late season rain. That can be an enormous advantage in the Foothills. Holly’s Hill has their 2011 Mourvedre Classique for sale ($25). It’s excellent. Very fruity, in the cranberry mode, and medium-bodied. 2011 was one tough year for the Foothills: snow on 4 June and four inches of rain on 4 October. But Mourvèdre could be left on the vine to continue ripening after the rain was over. Skinner also has a Foothills Mourvèdre, albeit 2012, and it too is clean, balanced, cranberry fruited, and medium bodied ($24). Both Holly’s Hill and David Girard are good examples to evaluate. They both make at least two stand-alone Mourvèdres, as well as a blend or two. Mari Wells, winemaking consultant at David Girard, likes Mourvèdre in the Foothills. David Girard Vineyard is only about a mile from Coloma (site of Marshall’s gold discovery on the south fork of the American River), and they make a point about drawing parallels to conditions in France’s Rhône River Valley. The Mourvèdre Girard makes from their head-pruned vines is their most expensive wine (2010 vintage $54). It’s a mouthful, with lots of oak, concentrated flavors, a chewy texture, and good acid balance. No one is going to call this wine flabby. Paso just starts from a different place. The Tablas Creek ($40), even in 2011, is a big, blowsy wine that smells like Bing cherries harvested for juice after the fresh fruit market is closed. Cypher made a nice Mourvèdre in 2011 ($55). It’s stylish, has an herbaceous thread woven through it, but remains resolutely big-bodied and plush on the palate. For contrast, consider Cline’s 2012 Ancient Vines ($20) offering sourced from the sandy Delta soils of Oakley. It’s fat, but still possessed of fine complexity. Or Bonny Doon’s 2010 Old Telegraph ($45), a wine simultaneously fresh and fruity in the nose, but dense and brooding on the palate. Given Mourvèdre’s long association with the east coast of Spain, it makes sense to look to Jumilla, and Valencia, and Penedes for a traditional food match. The easiest one, and a real good one, is Serrano jambon (dry-cured ham), olives, some smoky cheeses, and crusty bread. That’s not exactly opening up new pages, but it works right down to the ground. Another item is equally traditional, and much less frequently seen in the US. Make a paella with kid goat and escargot. It’s delicious. Plenty of saffron, lots of garlic, some dried ancho chiles, Japanese (narrow) eggplant, handful of golden raisins, and about a pound of pork sausage. Get the goat at a Mexican market. Cut it up into cubes. Clean the snails in hot water (not boiling), and only put them in the dish at the end, like you would with clams. The dish is communal and very hearty. So is the wine. Mourvèdre’s ample extract helps to focus the rich flavors and rounded textures of the food. The density of the wine’s taste is a match for the strength of the food’s impression. Everyone can have a second glass and another scoop of paella. This combination is particularly good when it’s cold outside. I generally use disposable paper bowls, and finish with citrus wedges. Easy peasy, after the shopping is done.